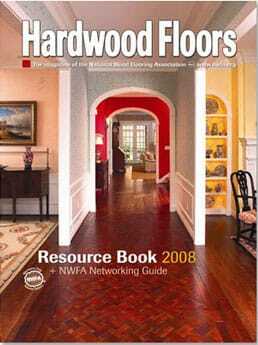 The National Wood Flooring Association publishes the Hardwood Floors Resource Book and Networking Guide every November. For the 2008 issue, they choose a Schenck & Company floor to grace the cover. The featured floor was hand-crafted of flat-grain mesquite in a basket weave pattern and the hallway is set off by dramatic, end-grain walnut inserts.